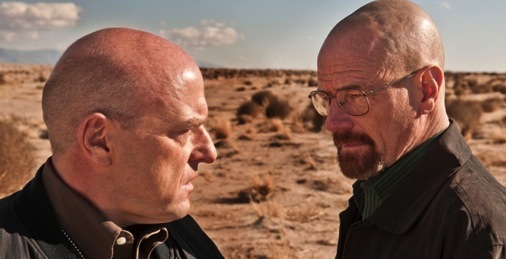 Incredible, indelible restarts have become the norm for Breaking Bad. And you’ll have seen another one after Sunday night’s episode begins the eight-part final arc of Walter White’s five-season journey from cancer-ridden Albuquerque chemistry teacher to a morally decayed drug lord with the street name Heisenberg. Titled “Blood Money” and premiering Aug. 11th at 8 p.m. (central) on AMC, the episode is dialogue-less until the 4 minute, 8 second mark, when a bearded, bespectacled White (Bryan Cranston) offers a simple greeting that prompts a stunned response. Then it’s on to the opening credits and back to where Breaking Bad left Walter’s DEA agent brother-in-law, Hank Schrader (Dean Norris). As you must know by now, he found a dumbfounding piece of evidence while seated four-square on a commode at the home of Walter, his wife, Skyler (Anna Gunn) and their son, Walter Jr. (RJ Mitte). Hard to believe, but It’s been close to a year since that episode first aired on Sept. 2, 2012. Rest assured that no spoilers are forthcoming here. So let’s just say that writer-creator Vince Gilligan does not dawdle in terms of shifting this tale into over-drive. A stun gun of a scene at the end of Sunday’s hour sees to that. And with all filming completed, everyone involved knows exactly how Breaking Bad will end on the night of Sept. 29, 2013 (when as fate and scheduling idiocy now have it, Showtime plans to launch Season 3 of Homeland at the same hour). Following a formal interview session late last month during the Television Critics Association summer “press tour,” Cranston expressed supreme confidence in what Gilligan has wrought. It’s hard to envision any lights at the end of these tunnels. Breaking Bad, if its past is any prologue, will steadfastly refuse to absolve or cleanse itself. But can it deliver a denouement that will further cement it as one of the great TV series of our times, any time? From Day One -- Jan. 20, 2008 -- it’s been an inimitably deranged ride into ever darker corners. Maestro Gilligan has directed and written the 62nd and final episode (subtitled “Felina”). That’s fitting, reassuring and the first time he’s taken on both duties since Episode 46 at the close of Season 4.
Who better to take the throttles as reckonings finally come to roost while great expectations take flight? Hold on. They’re coming. And Sunday’s bold, declarative return gives every indication that Breaking Bad will know what to do and how to do it before “The End” of its days.